(Abuja, June 2, 2018:)Liberia’s Ambassador to Nigeria, Professor Al-Hassan Conteh has held a successful business and investment meeting with the President of the Abuja Chamber of Commerce and Industry, Mr. Prince Adetokunbo Kayode. 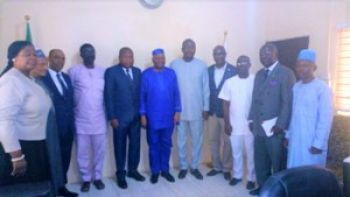 Held in the office of the Chamber in Abuja, the meeting aimed at forging possible collaboration with the Abuja Chamber of Commerce and Industry that would work out modalities leading to the organizing of a joint Liberian-Nigerian Business/Investment Roundtable, a release from the Liberian Embassy in Abuja says. According to the release, said joint Liberian-Nigerian Business/Investment Roundtable would engage Nigerian businesses to invest in the promising Liberian economy. The proposed roundtable will also seek to inform interested business firms or companies about the economic landscape in Liberia and business opportunities between both countries that have continued to enjoy long and firm bilateral relationship. The release recalls that the President of the Republic of Liberia, His Excellency George Manneh Weah, during his two-day state visit to the Federal Republic of Nigeria early March of the year declared that Liberia was open for business to Nigerian investors. During the meeting held on Thursday, May 31, 2018, Ambassador Conteh lauded Mr. Kayode for his invaluable contributions to Liberia, especially the post-conflict reconstruction and development efforts Mr. Kayode undertook when he served as Minister of Defense of the Federal Republic of Nigeria. Informing that Liberia was richly endowed with plethora of resources and offers opportunities in many sectors, including agri-business, tourism, infrastructure, energy, transportation, inter-alia, Ambassador Conteh observed that Mr. Kayode’s long historical association with Liberia makes the Nigerian Chamber of Commerce a better place in popularizing the ‘Pro-Poor Development Policy’ of the Weah Administration. Responding, the President of the Abuja Chamber of Commerce & Industry, on behalf of the Executive Council, expressed delight for the meeting and thanked Ambassador Conteh for taking the necessary first step to engage the Nigerian business community in a bid to further cementing the already cordial bilateral friendship and cooperation subsisting between Liberia and Nigeria. President Kayode averred that Nigeria was anxious to do business in and with Liberia, adding that the well-being of Liberia was a job that has to be completed. “Once we (Nigeria) were with you (Liberia) in times of trouble, we must continue to remain engage in times of prosperity”, he added. He stressed the need for a platform in the form of a Liberian-Nigerian Business Council to take the lead on this initiative and engage both governments and the private sector to take the President’s request one step further, while at the same time acknowledging the fact that doing business in Liberia was a win-win or mutually beneficial partnership. Following President Weah’s pronouncement welcoming Nigerian investors to Liberia, the Embassy of Liberia in Abuja had since embarked upon vigorous outreach programs aimed at attracting potential Nigerian investments to Liberia within the context of the new ‘Pro-Poor development agenda’ of the Liberian Government. Ambassador Conteh was accompanied to the meeting by Mr. Tunde Johnson Spencer and Daniel Rogers, Counselor for Political Affairs and First Secretary/Consul at the Embassy of Liberia respectively. The President of the Abuja Chamber of Commerce also had alongside him some Executive Council members, including Chief. Emeka Obegolu (ESQ), Second Deputy President, Mr Anene Johnson, Vice President for Commerce, and Engineer Taiwo Oluseyi, among others, the release concludes.